Microsoft launches disc-less Xbox One S All-Digital Edition. Microsoft has today announced a disc-less gaming console - the Xbox One S All-Digital Edition. The Xbox One S All-Digital Edition was created for those who prefer to find and play their games digitally and are looking for the most affordable way to play Xbox games. The Xbox One S All-Digital Edition comes bundled with three of Microsoft's most compelling and popular games - Minecraft, Forza Horizon 3 and Sea of Thieves. If you haven't tried Xbox Game Pass yet, the Xbox One S All-Digital Edition comes with a special offer to get started with access to over 100 great games, and with new games being added all the time there will always be something new to queue in your digital library. Go all digital with the Xbox One S All-Digital Edition and build a library of digital games that travels with you and is available in the cloud. Take your cloud saves on the go, and enjoy the ability to preorder and pre-install upcoming games so you're ready to play the moment they launch. Cord cutters will enjoy watching 4K HDR entertainment with Netflix, Amazon and more, and thousands of Xbox One games are available from the Microsoft Store digitally. 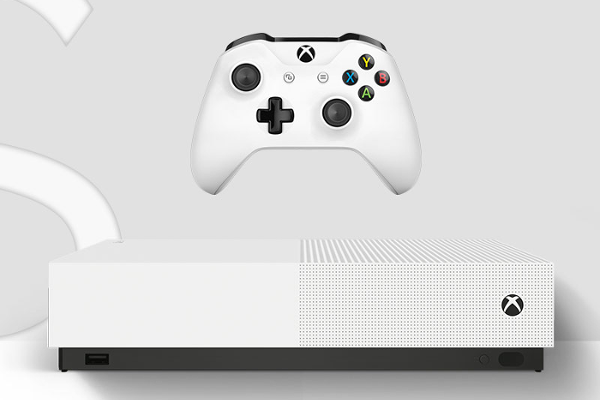 Available for pre-order today at $249.99 USD, the Xbox One S All-Digital Edition is $50 USD less than Xbox One S, and Microsoft expect to maintain at least that price difference between the two consoles going forward.